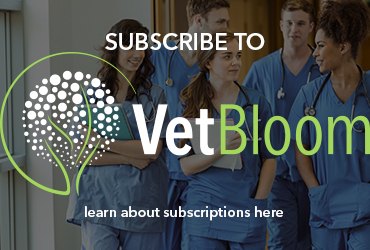 Fluid therapy is a fundamental component of human and veterinary medicine. However, there is a vast discrepancy in research-guided fluid therapy protocols for exotic animal medicine compared to dogs and cats. As exotic animals become increasingly popular, owners will expect advanced treatment options for their unique pet and appropriate fluid therapy is just one of them. 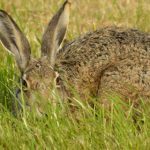 Often by the time an emergent exotic animal is brought to the veterinary clinic, it is already suffering from moderate to severe dehydration and hypovolemic shock. These two conditions usually are not acute unless from severe blood loss. They are usually chronic in nature and have been hidden by the patient’s instinctual masking behaviors. In the small animal world, moderate to severe dehydration and hypovolemic shock warrants aggressive fluid therapy. Theoretically, this also applies to exotics. However, here lie a few problems. First is the lack of basic research into physiology and clinical medicine. There are few published fluid studies available in exotic animal medicine. As a result, many fluid therapy guidelines for exotics are extrapolated from small animal studies and anecdotal evidence. Species diversity is another limiting factor in the creation of fluid guidelines for exotic animals. There are thousands of different species with intricate physiological differences. The final challenge is that of intravenous (IV) access. Intravenous catheterization and fluid administration in stressed and decompensated small exotic animals comes with potential life-threatening risks from handling and increased stress hormone release. Once a decision is made to pursue fluid therapy, one must be extremely careful to prevent iatrogenic over-hydration. This leaves practitioners having to weigh the benefits to the associated risks. Replacement of fluid loss caused by dehydration, disease, hemorrhage, etc. Birds: Depending on the size of the bird, an IV catheter can be placed in the right jugular vein, basilic vein or medial metatarsal vein. 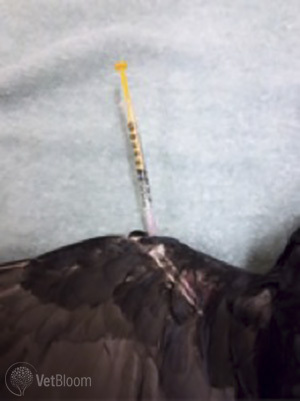 In smaller birds, one may find it easier to place an intraosseous (IO) catheter (Fig. 1). Anatomic sites used for IO catheter placement include the distal ulna and the proximal tibiotarsus bone under appropriate anesthesia/analgesia. The humerus and femur should be avoided for any IO catheter in the avian patient as they are pneumatic and can drown the patient if fluids are given through these sites. In the event either route cannot be accessed, SQ and PO routes can be effective. SQ fluid can be given in the inguinal region of birds, but careful attention is required to prevent over-infiltration, which can lead to disrupted blood flow and abnormal locomotion. 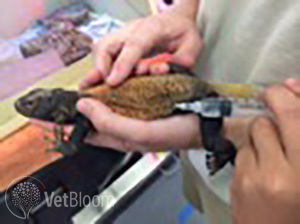 Reptiles/Amphibians: These species will often require a surgical cut down for IV access. The jugular vein, dorsal coccygeal vein, and the subcarapacial vein and plexus can be accessed in chelonians percutaneously. In larger species of lizard, tail veins (Fig. 2) and the mid abdominal vein can sometimes be accessed percutaneously. IO catheterization of the humerus and femur are more practical sites for IV fluid administration. In the event either route cannot be accessed, intracoelomic, SQ (Fig. 3) and PO routes can be utilized. SQ fluid volumes will need to be given at smaller volumes due to the lack of SQ space. 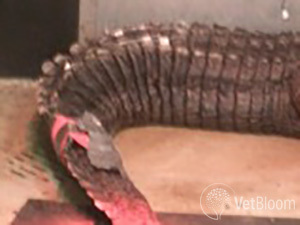 In snakes, intracardiac administration may become necessary if the ventral tail vein cannot be accessed. Small mammals: All of the same sites and methods used in dogs and cats can be used in small exotic mammals. The only caveat is the particular species anatomy and difficulty level. Ear veins (Fig. 4) are readily available in rabbits and mini pigs, while wing veins can be accessed in bats. 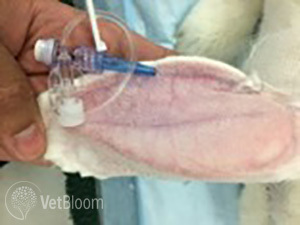 IO catheters can be utilized in decompensated animals or emergency situations. 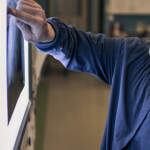 Micro catheters are manufactured for the research setting and can be used for IV fluid administration in the tail veins of mice and rats instead of IP fluid administration. Crystalloid and colloid fluids are the two most common fluid types used in fluid therapy. Crystalloids are water-based solutions that come in a variety of solutions, some of which mimic electrolyte concentrations of plasma. There are three types of crystalloid fluids. Isotonic fluids have an equal osmolarity to surrounding erythrocytes and don’t cause fluid exchange across cell membranes. Isotonic crystalloids are effective at expanding the intracellular space. Hypotonic fluids actively increase erythrocyte volume, while hypertonic fluids pull water away from erythrocytes, decreasing their volume temporarily. Crystalloids are composed of smaller molecules and are osmotically active throughout body fluids. Crystalloids are permeable through capillary membranes. Colloids are also water-based but are a much larger molecule. They can be natural or synthetic and usually stay within the vascular space. Colloids can only be given IV or IO. Compared to naturally-derived colloids found in plasma (whole blood and albumin), synthetic colloids have an extended effect on intravascular volumes. Synthetic colloids also offer an extended intravascular volume expansion effect and can reduce total crystalloid volumes by 40-60% when used in conjunction with each other. Their negative charge attracts water and sodium and colloids are infused at much smaller volumes compared to crystalloids either by bolus or CRI. Most synthetic colloids do not provide plasma proteins or hemoglobin. However, Oxyglobin™ and other synthetic blood products offer volume expansion with the added benefit of tissue perfusion. Synthetic blood products have been used in birds and reptiles without complication. A negative attribute of Hetastarch™ is its effect of prolonging active clotting times. As mentioned above, hypovolemia is a common condition in exotic animals. Osmotic forces in the interstitium at > 5% dehydration begin to pull water away from the intravascular space, which then affects perfusion. Filling the intravascular space with fluid that can be pulled into the interstitial space is key. It will also aid in cardiovascular support. Remember poor perfusion also means poor oxygenation! Normovolemia is essential to correct before hydration therapy. Goal-driven fluid therapy is important in all species, but even more so in the lesser understood exotic animal to avoid overhydration. Commonly, goal-driven fluid therapy is defined as giving the least amount of fluid to achieve certain endpoints within normal vital sign ranges for that particular species. Some endpoints include, but are not limited to, blood pressure, capillary refill time/ mucous membrane color, pulse quality, body temperature, mentation, heart rate, respiratory rate and urinary output. Blood component products and concentrated albumin are also effective means of intravascular expansion, but may not be practical in the exotic animal setting. Fluid therapy is often imprecise, especially with exotics. Every animal is continually undergoing compartmental volume fluctuations combined with varying “ins and outs” based on the patient’s disease process and its willingness to consume water. Three principles exist that are rather constant among all species of animals when fluid therapy is indicated. Fluid resuscitation: This step may require a variety of fluid types (i.e. crystalloids and colloids). If cardiac conditions allow this initial step, for chronic conditions can be done relatively safely in 12-24 hours with close monitoring. In more acute situations, replacement fluids can be given over as short as 1-4 hours with close monitoring for fluid overload. Hydration: This entails replacing interstitial fluid. Maintenance and replacement of continued fluid loss: Fluid losses include respiratory, salivary, urine, blood loss, weeping wounds. All too often, rather than first focusing on goal-driven fluid therapy for fluid resuscitation, fluid therapy starts and ends with maintenance fluids for many exotic patients. Unfortunately, in many practices, fluid therapy is only utilized during surgical procedures or for a short duration while the animal is hospitalized. This stems largely from the practitioner’s unfamiliarity with a species and few species-specific fluid therapy protocols. Sadly, this leaves many exotic pets in a state dehydration and hypovolemia.